When it comes to innovation, ceramic artists rank at the top. What is it about clay that brings out the creative spirit in us? Unlike a canvas to be painted or a stone to be carved, clay presents unlimited possibilities. You can shape it, throw it, pour it, carve it, stamp it, paint it anything. It's the most versatile of mediums. For creative artists choosing clay, there's no telling what the results will be. In this collection of techniques, profiles and projects, more than 25 innovative artists explore some of the vast possibilities clay has to offer. From Amy Santoferraro's Plate-O-Matic and Shuji Ikeda's elegant woven baskets to using clay as a canvas, there's no end to the possibilities. 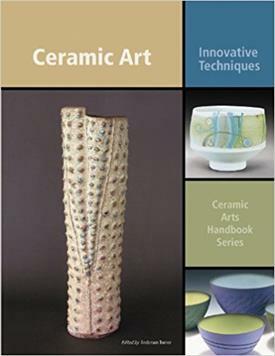 Ceramic Art: Innovative Techniques touches on the many creative things you can do with clay. During any stage of forming, decorating or firing, infinite variables allow ceramic artists to explore and expand the vast landscape clay has to offer. For more than 10,000 years, clay has been a medium every artist can use. Although it's a technique that's been around for awhile, Mike Baum has mastered the technique for making Squared Casseroles. If you're curious about combining thrown parts to slabs, you'll appreciate the detailed step-by-step Mike offers. Amy Santoferraro has fun making molded ware and she refers to her technique as the Plate-O-Matic. Using her skills as a printmaker, she expertly silk screens images in underglazes onto slabs then forms the clay to the mold by pushing it against foam rubber. She does what? Take a look. North Carolina potter Gillian Parke has a passion for finding harmony in what might appear contradictory. With clay containing Feldspar Inclusions she merges English porcelain and Japanese Shigaraki traditions with her mix of wood firing, decals and lusters. Takeshi Yasuda works to achieve a mellow fluid liquidity. To express the clay's dynamic, he throws Upside Down Porcelain by first throwing tall cylinders that he allows to collapse then suspending them upside down. Don Hall began pottery by learning on the wheel. After many years, he got involved in handbuilding and discovered many techniques including one for making Multi-sided Forms. His simple step-by-step makes it possible to innovate any number of sides. Shuji Ikeda constructs elegant flower arranging vases by borrowing from another medium and Weaving Clay. Using the natural character of the clay, he masters the way the clay rolls, twists, breaks and bends. Combining Clay and Light brings the earthiness of clay together with radiant light. Grace Nickel makes wall sconces with clay and glass and manipulates the best qualities of both to create innovative lighting effects. Linhong Li and Thomas Orr are both painters using clay as a canvas. Li's Slab Paintings breaks with traditional ceramics and painting and combines both. Orr builds up many layers of slips and glazes to create abstract textured Ceramic Paintings. Burnishing and Pitfiring are ancient Native American techniques. After Michael Wisner thoroughly mastered the traditional pottery making methods, he adapted the techniques to commercially available ceramics products. Amy Lemaire uses Glass As Glaze by adding glass beads to the surfaces of her work. Working as a potter, she makes and bisque fires pieces then high fires them in a soda-glaze high fire kiln. A third firing to a very low temperature is where she adds glass beads. Joyce Jablonski uses Layered Surfaces with Decals using a process she learned in a porcelain factory in Norway. Jablonski is thoroughly engaged by natural shapes and forms, which are enhanced by her layers of color, stencil and decal work.